I take the two pysillium husks in the morning as soon as I wake up with a glass of water with a dash of cider vinegar. 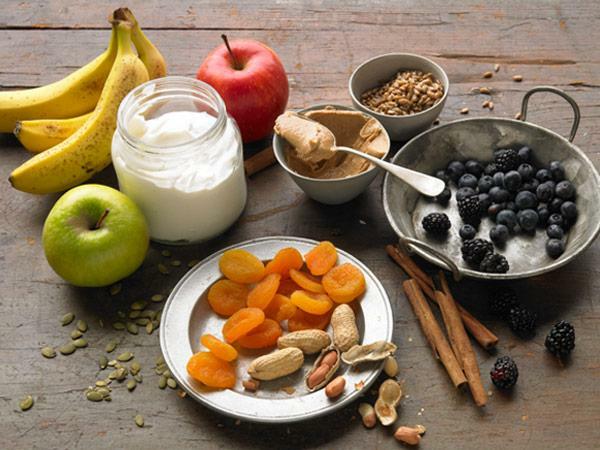 Then follow with the slippery elm, vitamin c and turmeric, before having a teaspoon of the Intestamine which is a NZ product that was recommended to me by my naturopath last year. I wait at least half an hour before eating and usually have a coffee in that time too, and I take a probiotic each evening just before bed. 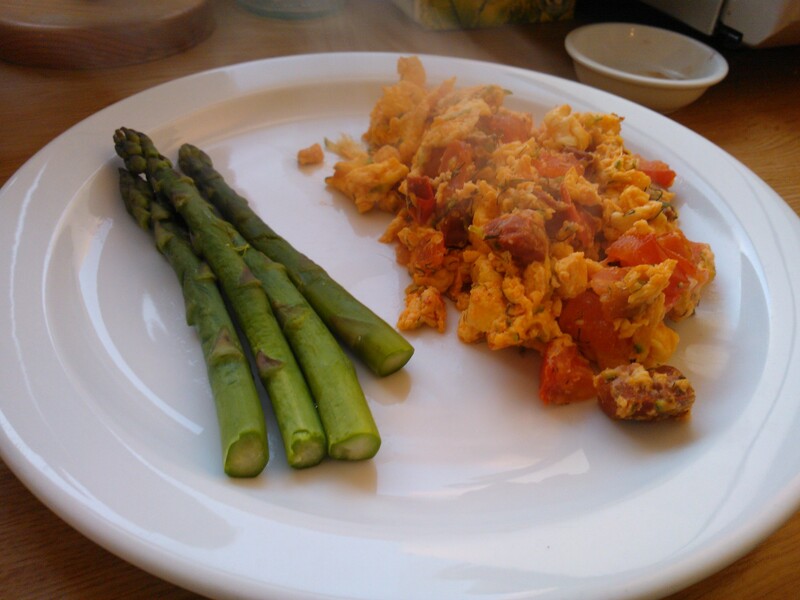 Day 1 – Scrambled eggs (2) with sweet potato, tomato, dill, avocado and ice berg lettuce. 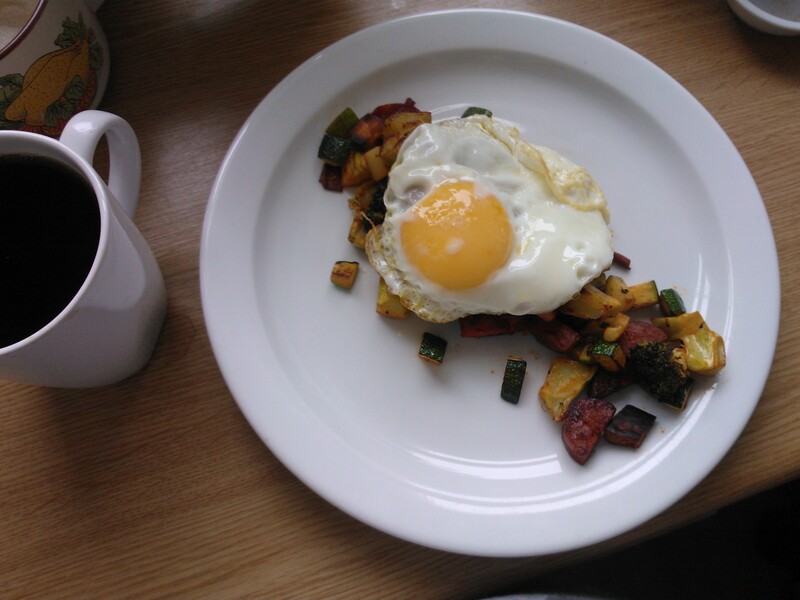 Day 2 – Chorizo, broccoli, sweet potato and courgette hash with a fried egg. 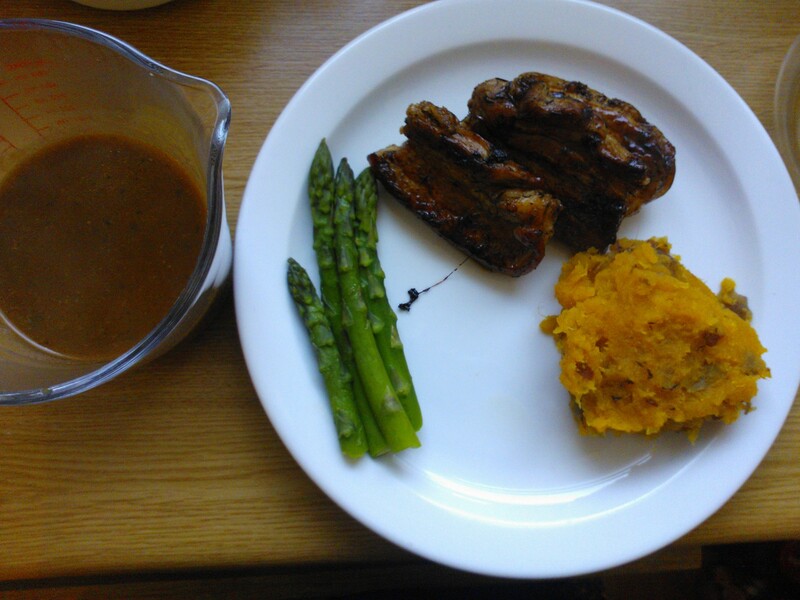 Day 4 – Exactly the same as yesterday it was so good! 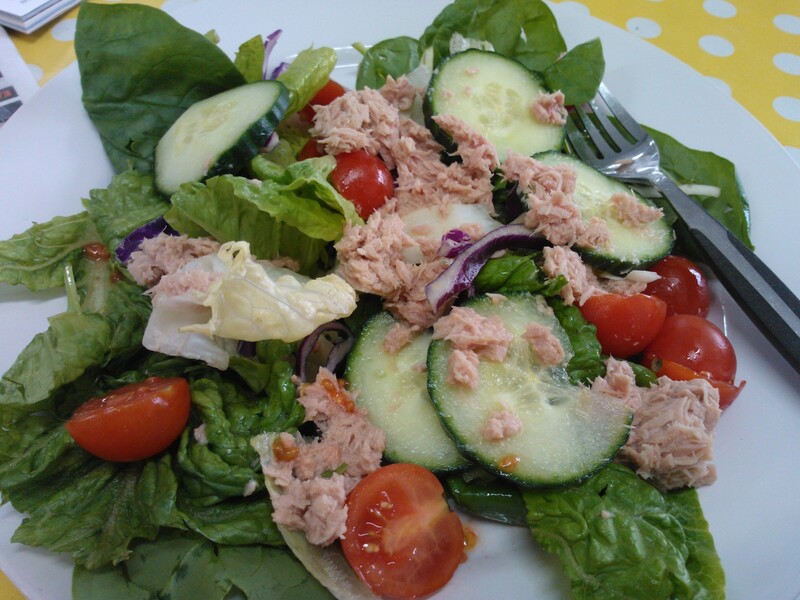 Day 1 – Salad with tinned tuna, tomato, cucumber and mixed leaves. 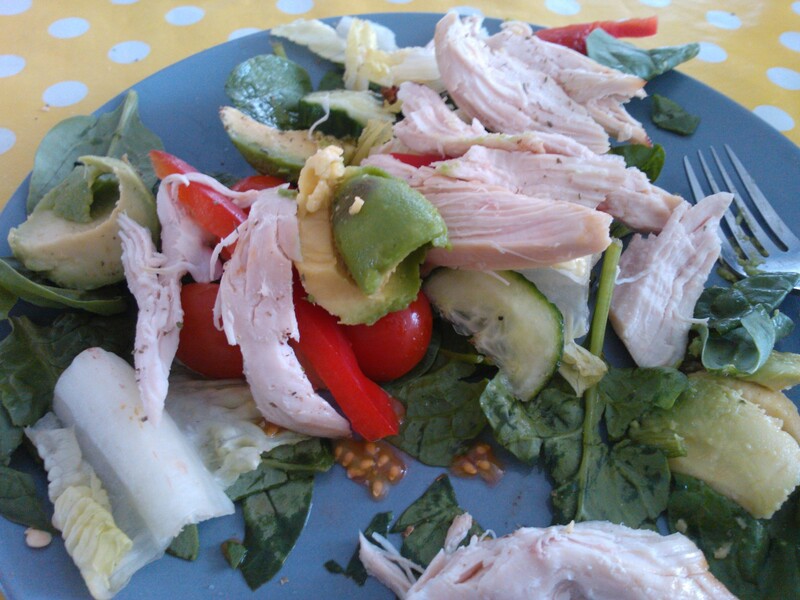 Day 2 – Salad with chicken breast, tomato, cucumber, peppers, avocado, mixed herbs and mixed leaves. 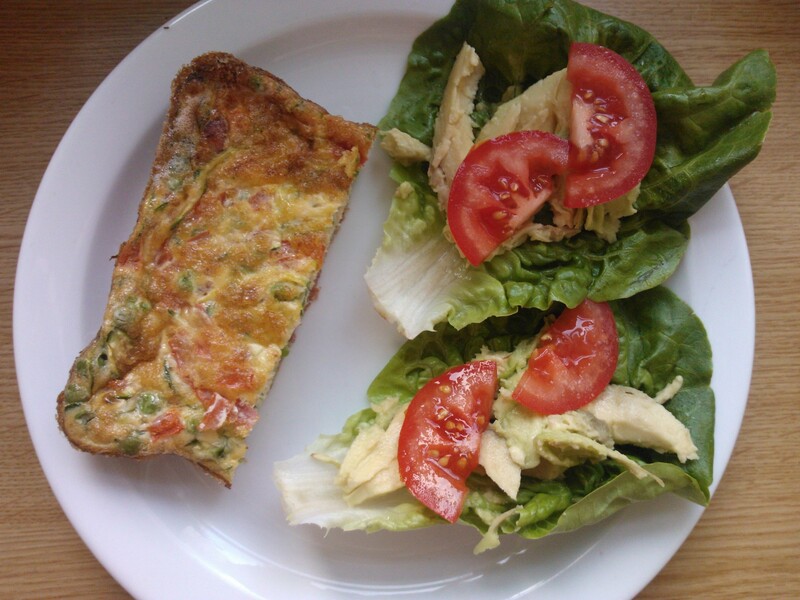 Day 3 – Chicken Salad with tomato, avocado, cucumber and cos lettuce. 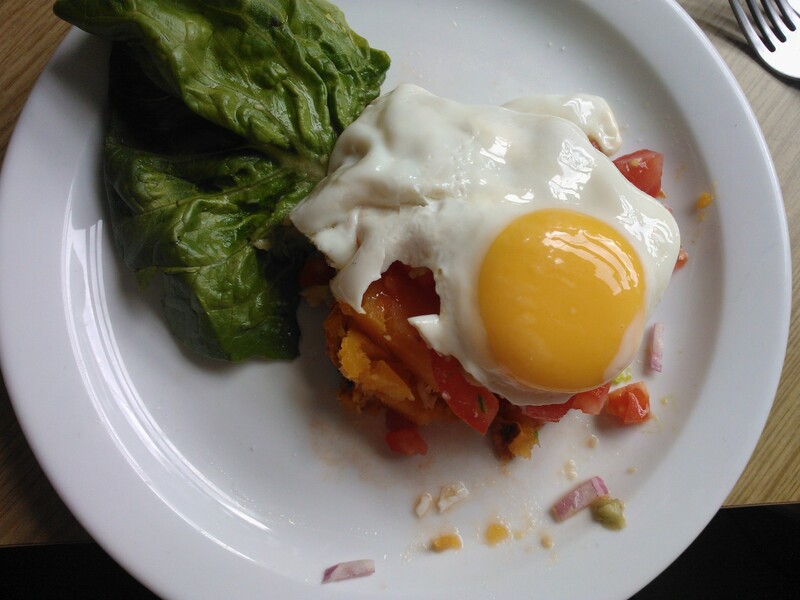 Day 5 – 1/2 a baked sweet potato, topped with fresh tomato, red onion, avocado and a fried egg, served with lettuce. 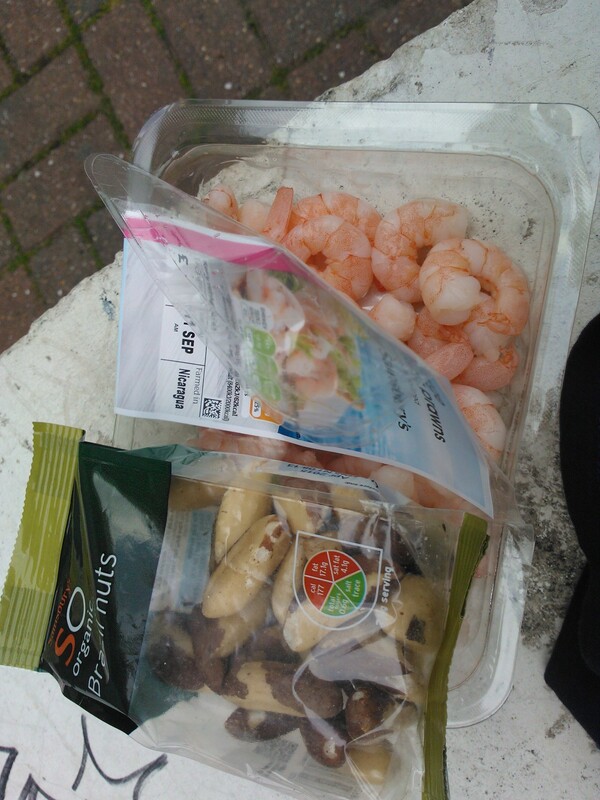 Day 2 – A small amount of mixed nuts, one piece of snacking chorizo and an apple. 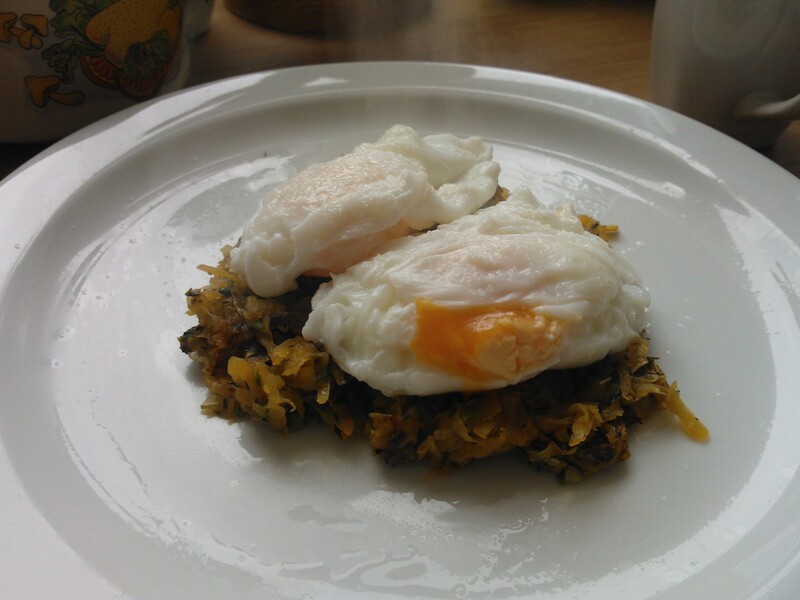 Day 5 – Same as yesterday! 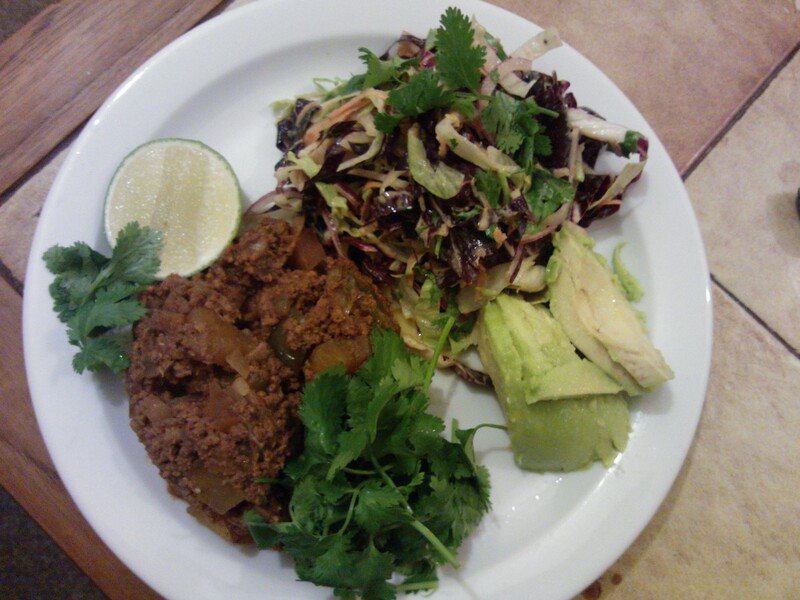 Day 4 – Chilli and Salad again! SO good, this should be the end of it now though. 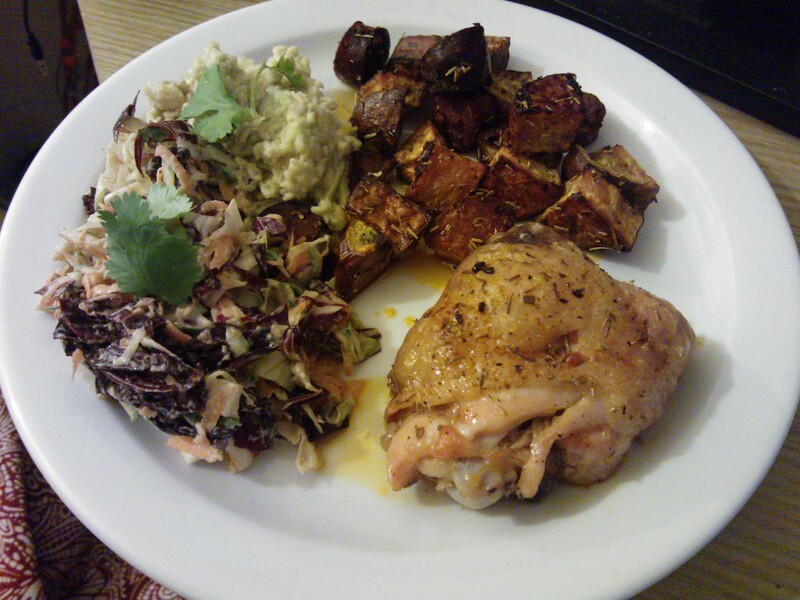 Day 5 – Roasted chicken thigh with lemon, sea salt, olive oil and bay leaf, roasted sweet potato with crispy chorizo and rosemary, and raddichio slaw with my beloved tahini dressing. Oh and a side of avocado with tabasco and fresh lime. Day 1 – Morning and during the day I was fine, until after work when I had to go to the supermarket and that was hard. I realised how many ‘normal’ foods I would usually eat had other added ingredients in it, even though I hardly eat preservative laden food normally. My sugar headache started to kick in and I started to feel irritable, but cured it temporarily with some snacking chorizo! Still felt bloated in the afternoon, but hoping that it’ll disappear by tomorrow. Day 2 – Slept really well last night, even managed to sleep in until 8:30 which isn’t like me! Usually wide awake at 7am. Felt bloated still today, may be the pysillium husks and that I need to drink more water. 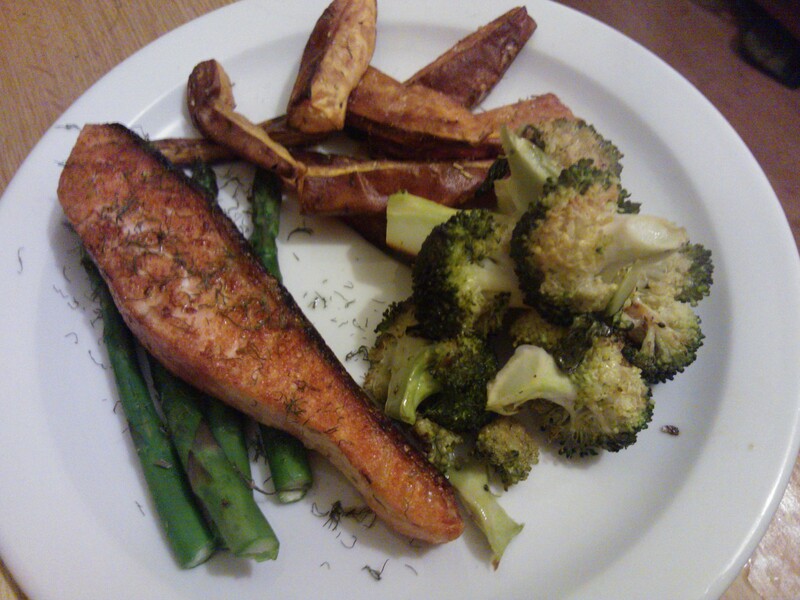 Had more energy in general, and only had a small amount of snacks between meals (literally like 4 nuts) I did have an apple though at about 5pm as I felt like I was crashing a little, and that sorted me out until I was home for dinner. Which, by the way was amazing. I discovered a new coleslaw dressing that is vegan and paleo friendly – 1 part tahini, 1 part cider vinegar, 1 part lemon juice, salt and pepper. Sensational. 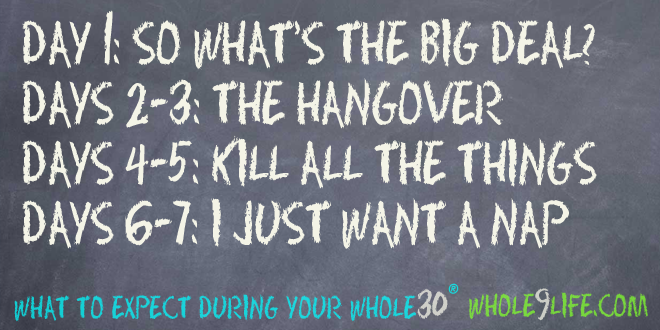 Day 3 – Found it hard to get to sleep last night, as I had a bit of energy, and this morning I got up fine, I didn’t even have a coffee first thing! I had detox feelings today, which is what I had last time I was strict, with a wierd metallic taste in my mouth, and you can feel the toxins coming out of your eyes and skin?! Hard to explain, but I remember this feeling from last time, it feels good when it goes away. Not so bloated today, still a little bit but much better than the past couple of days. Had a gin with soda and fresh lime at the pub for a colleague’s birthday. Feeling tired this evening, but may be due to early start and busy day at work. Hardly had any snacks today which was good, or sugar cravings! Day 4 – Was wide awake before 7am this morning, and did have a coffee, although I din’t feel like one straight away. Slept so well the night before. Had loads of energy before I went to work, I didn’t know what to do with myself! Felt like I was overwhelmed with excitement or something. Ended up feeling the toxin detox feeling again after about lunchtime. I looked online last night to see what it was about, and it sounds like it’s called ‘die off’ where the bad bacteria in your gut is being starved from sugar and starchy carbs that they feed on, and the symptoms you feel are your body getting rid of them! Wierd, and kinda gross I guess, but good they are getting outta me! Felt a bit exhausted in the evening, still bloated, I think I need to up my water intake at work. 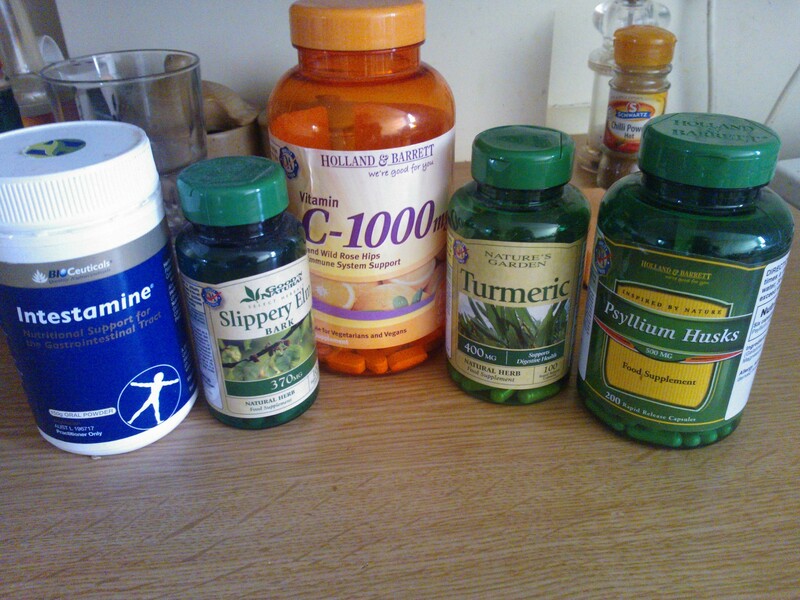 Day 6 – I had good energy this morning, but then by the afternoon and evening I felt tired again. I was wide awake at 5:30am, but managed to get an hours sleep before getting up at 8:30. The paleo gravy achievement was the highlight of my day, I boiled carrots, shallots and garlic in homemade bone broth, and then whizzed it up with a hand blender to make it thick. I then de-glazed the pan I cooked the pork in with the gravy, and reduced it down to make it thicker, and to soak up all of the balsamic vinegar and pork juices. I also didn’t feel bloated at all today which is great! Day 7 – I had a good amount of energy this morning, I rode to Shoreham from Brighton and was high on life until about 1pm when I started to feel tired. Not overly tired, just not as much energy. I was bloated again today, I am wondering if it is the pysillum husks? I might stop them next week just to experiment. They have made me bloated before, but sometimes I find them amazing. Watch this space to see if it makes a difference next week! I hope that my information has been helpful or inspiring to you, please don’t hesitate to get in touch via the contact form below, or via social media, if you have any further questions or would like some more information on the meals that I cooked. Also, please feel free to share your experiences and meal ideas below!